We have embarked upon an important time of the year – budget season has officially begun. Your input is valuable as the D.C. Council prepares for the Fiscal Year (FY) 2017 budget. The Mayor released her proposed FY17 budget on March 24, and the Council began its budget oversight hearings on April 6. 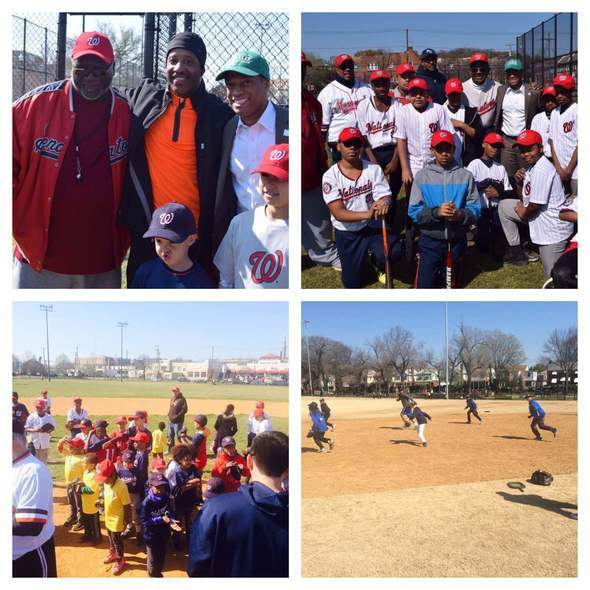 I encourage you to weigh in on your budget priorities for Ward 5. The full schedule can be found here. 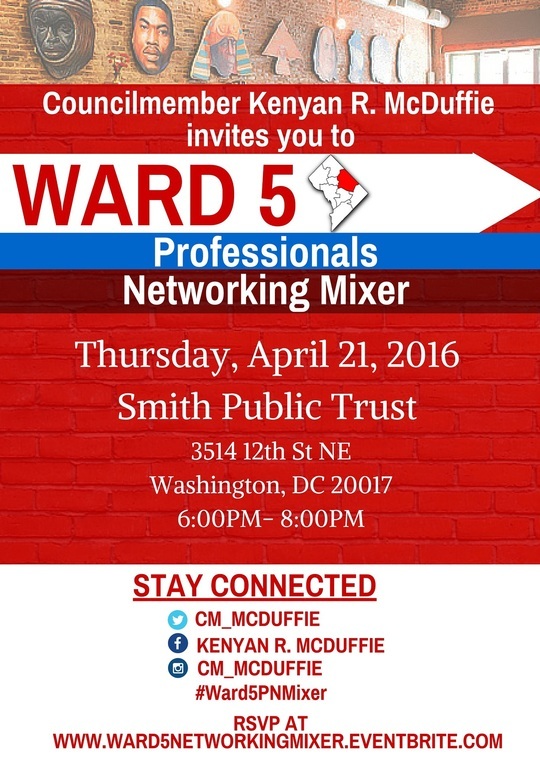 On another note, I am excited to announce my second Ward 5 Professional Networking Mixer on Thursday, April 21 at Smith Public Trust located at 3514 12th Street NE from 6pm-8pm. We received an overwhelmingly positive response with nearly 300 people in attendance at the initial Mixer. If you are unable to make this one, contact our office for further information on the next Mixer or follow the buzz on Twitter @CM_McDuffie and use the hashtag #Ward5PNMixer. On Tuesday, April 5, Councilmember McDuffie along with Chairman Mendelson and Councilmembers Bonds, Grosso, May, Nadeau, and Silverman introduced the “Comprehensive Youth Justice Amendment Act of 2016,”a bill that makes sweeping reforms to the District of Columbia’s juvenile justice system. The Committee on the Judiciary will hold a hearing on the bill June 1, 2016. On March 22, 2016, the Committee held a hearing on The “Office of Unified Communications Karima Holmes Confirmation Resolution of 2016”. The resolution nominates Ms. Karima Holmes to serve as the Director of the Office of Unified Communications (OUC). OUC has been without permanent leadership from April 2015 to January 2016. The Committee received testimony from Acting Director Karima Holmes’ about her experience and vision to efficiently move OUC forward by promoting superior customer service and effective community outreach efforts. The Committee also considered Bill 21-0506, the “Establishment of the Community Health Emergency Link Paramedicine Pilot Program Act of 2015”. Councilmember McDuffie introduced this bill on December 1, 2015 with Councilmembers Bonds, Orange, May, Cheh, Allen, and Chairman Mendelson as co-sponsors. The bill would establish a pilot community paramedicine program under the supervision of the Fire and Emergency Medical Services Medical Director, that is operated by emergency medical services providers. The program would not compete with other community health care services but instead is intended to identify and fill gaps, create a hub for medical resources and care, and work in partnership with existing health care providers. Finally, the Committee considered Bill 21-0615, the “Notice in Case of Emergency Amendment Act of 2016”. On February 16, 2016, Councilmember McDuffie introduced this bill along with Councilmembers Bonds, Alexander, and Cheh. This bill strengthens OUC’s medical information profile program by expanding the means by which residents can register their medical profile or “Smart Safety Profiles.” OUC currently has 3,624 residents enrolled in this program. This bill permits OUC to expand the registration method beyond a telephone number to include the resident’s Department of Motor Vehicles (DMV) issued identification number, home address, social security number, or other means pursuant to written standards developed by OUC. This bill also implements a vehicle and home decal program that alerts first responders that the vehicle glove compartment or the home contains a hard copy of the resident’s Smart Safety profile. Lastly, the bill requires the DMV and OUC to develop a Smart Safety profile request form that will be made available to residents at the DMV. 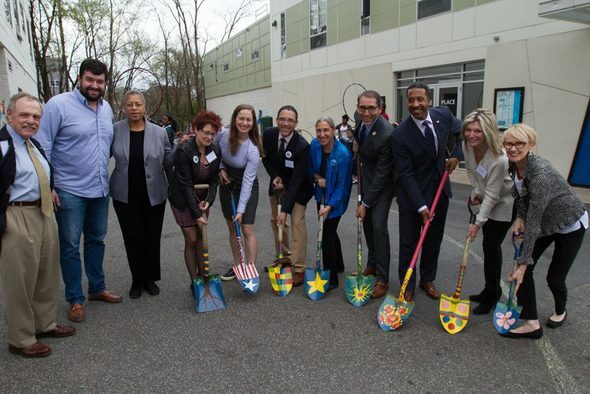 On Thursday, March 31, 2016, Dance Place hosted the groundbreaking ceremony for their 8th Street Arts Park. Councilmember McDuffie was thrilled to be a part of this joyous occasion. Since 1986, Dance Place has served as a vital cultural hub in the Brookland and Edgewood neighborhoods. Because this alley currently operates as an emergency route to the nearby Metro tracks, Dance Place has developed a creative proposal that would convert the alley into a community of space without the use of any permanent structures. In the event of an emergency, the alley will still be available to first responders. When developed, the new Arts Park will add vibrancy, artistry and green space to the area. It will transform the now vacant asphalt alley into a welcoming creative space for art events, creative expression, social interaction, community gardening and recreational play. Construction for the park has begun and a soft grand opening is scheduled for summer 2016. On Wednesday, April 20, The District Department of Transportation (DDOT) will host the second public workshop for the Crosstown Multimodal Transportation Study at Chavez Prep Middle School located at 770 Kenyon Street NW from 6:00 pm-8:00 pm. 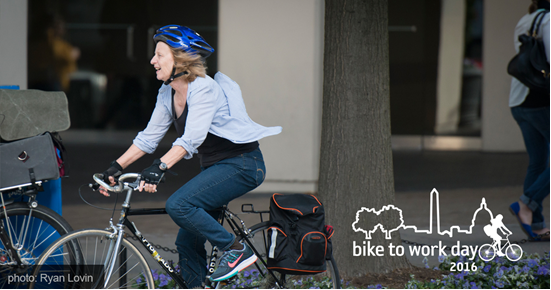 The purpose of this workshop is to present preliminary concepts that enhance multimodal connectivity, mobility, and safety and gain community feedback. DDOT is undertaking the Crosstown Multimodal Transportation Study to identify improvements along the east-west connections in Ward 5. DDOT will work with the Ward 5 community and key stakeholders to evaluate and develop a range of physical and operational improvements. The Crosstown Multimodal Transportation Study is a key project in the two-Year Action Plan for moveDC, the District of Columbia's multimodal long-range transportation plan. For more information about the study, please contact DDOT Project Manager, Katherine Youngbluth, at katherine.youngbluth@dc.gov or (202) 645-8625 or visit the study website at www.dccrosstownstudy.com. Back by popular demand! You asked for it……………. Please join me on Thursday, April 21 at Smith Public Trust from 6:00 p.m. – 8:00 p.m. for my second Ward 5 Professionals Networking Mixer. Smith Public Trust is located at 3514 12th Street NE. You may access the Brookland-CUA red line train on the Metro. There will be music, light appetizers, great conversation and more. Share with your neighbors. 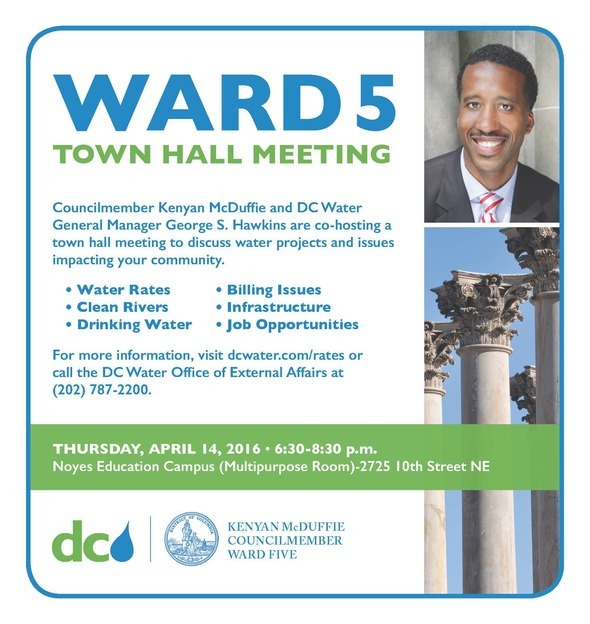 Please RSVP here and use the hashtag #Ward5PNMixer. On Tuesday, May 3, from 8:00 am-12:30 pm at the Marriott Marquis Hotel located at 901 Massachusetts Avenue, NW, DC Health Link, the DC Chamber of Commerce (DCCC), the Greater Washington Hispanic Chamber of Commerce (GWHCC) and the Restaurant Association Metropolitan Washington (RAMW) will host a small business forum “POWER UP DC 2016: Get Money, Get Movin’… Accessing Capital to Start and Grow Your Business With Non-Traditional Funding Resources” during National Small Business Week. There will be three workshops with expert panelists who will share information to enhance business growth through non-traditional funding streams and creative financing options. A Matchmaking Meet-up with Business Resources session will be held where business owners can meet one-on-one with lenders. Finally, DC Health Link will be onsite with licensed /certified brokers who will share information about how the Affordable Care Act can benefit small business owners, their employees and provide enrollment assistance for quality affordable health insurance through DC Health Link. Please note that the registration is FREE for all attendees. To register, please visit here. For more information about the event, contact Linda Currie at (202) 638-7337 or at lcurrie@dcchamber.org. For more information about DC Health Link and to get a copy of the enrollment checklist, please visit here. 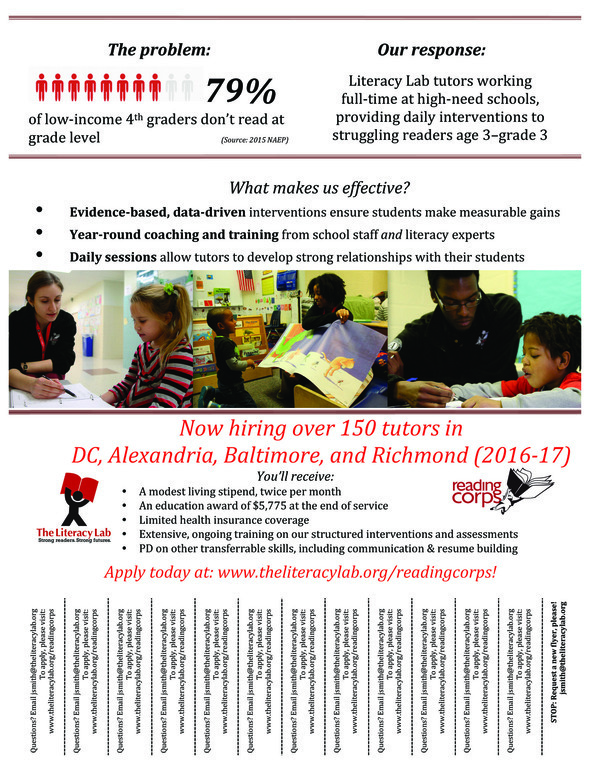 The Literacy Lab is Hiring!